Mark Johnson, candidate for Oregon State Representative in Hood River and Sandy was working hard to spread his campaign message and engage voter’s in his rural district. He tried traditional town halls and other forums, but typically only saw 20-25 people show up to his events. Looking for a better solution to reach voters, Johnson tried Common Ground’s telephone town hall service two weeks before election day. He focused his discussion for town hall on seeking input and feedback from voters on local job creation and improving education. Engage and listen to district voters to build name identification and enhance exposure of campaign message. Getting voters to become engaged and participate in Johnson’s campaign. Auto-dial over 14,000 phone numbers in Johnson’s district asking them to participate in a Q & A discussion about local schools and job creation. Once the dials were answered, callers simply had to press 1 to join the live one hour discussion. Additionally, Johnson used social media and his email list to promote participation in the telephone town hall, providing voters with option to sign up online for the town hall. After the telephone town hall was over, Johnson posted the audio file of the discussion to his website and sent out a copy through his e-newsletter program. Click here to listen to Johnson’s telephone town hall. 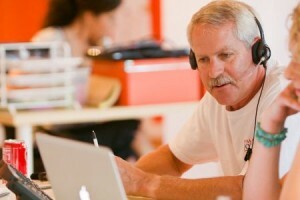 Learn More About Telephone Town Halls Now!